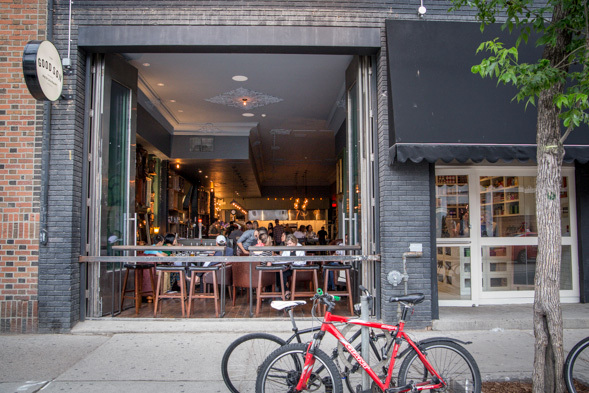 The Good Son restaurant, from chef Vittorio Colacitti (of Top Chef Canada fame), is now open at Queen and Dovercourt at the address formerly inhabited by the clubby Nyood . Enter through the pantry, which serves as a hostess station and doubles as a pizza takeaway counter and retail outlet for the Colacitti family's olive oils. Further inside, you'll find a cozy and eclectic room that echoes the comforts of home. 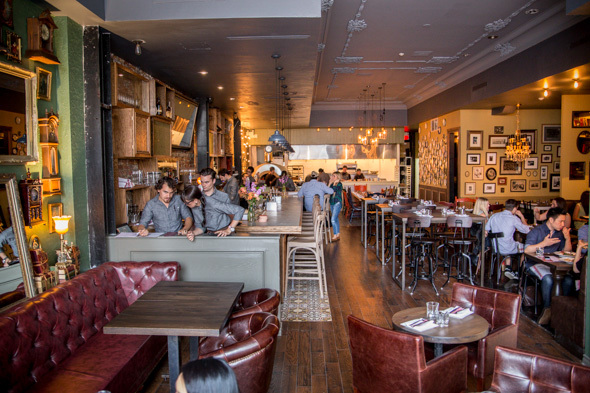 Leather wingback chairs and tufted booths furnish the lounge, while the kitchen at the back of the room overlooks a 18-seat harvest table. 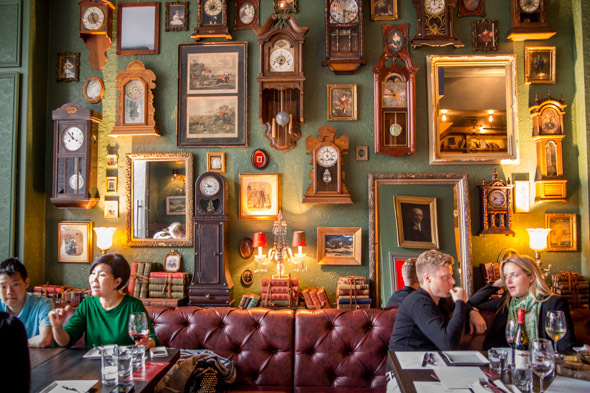 Faux heirlooms like ornamental dishes and a collection of chiming clocks adorn the walls. 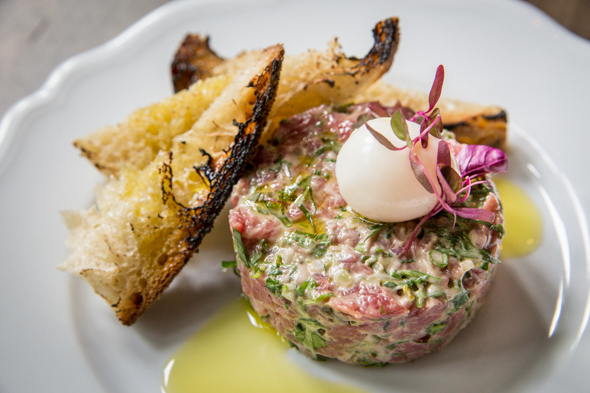 The menu features dishes like the steak tartare ($19), which pay tribute to Colacitti's mentors and the melting pot of cuisines found in Toronto. Done in the style of Didier , hand chopped beef tenderloin is tossed with cornichons, shallots, capers and herbs before being finished with a soft-boiled quail egg and lightly grilled sourdough. 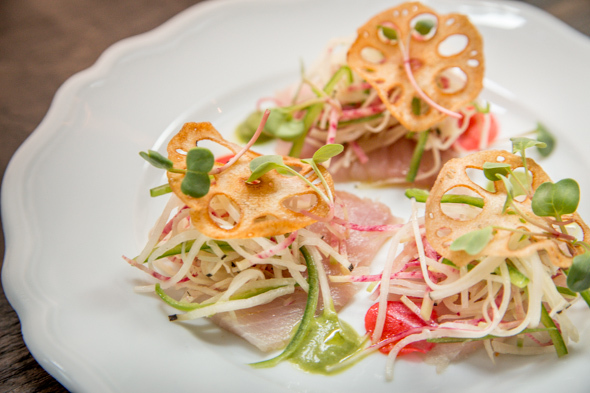 Hamachi crudo ($13) crowned by lotus root chips is complemented with vibrant flavours of tomatillo puree, pickled radish and jalapeno slaw. Crispy potato-wrapped jerk shrimp ($13) are served three per order, with a tart Thai green mango slaw and a garnish of fresh peanuts. 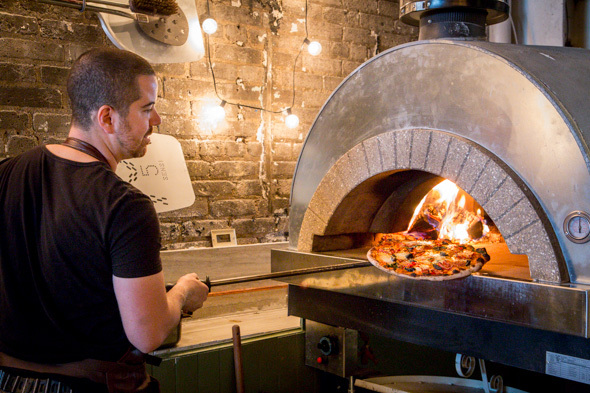 Pizza, overseen by sous chef Andrew Leblanc (formerly of Pizzeria Via Mercanti ), is a cross between Roma and Neapolitan styles. Cooked in a wood-burning M.A.M pizza oven imported from Bologna, it yields a crust that is thin but sturdy. The spicy sopressata ($15) begins with a base of sweet tomato sauce, a combination of buffalo mozzarella and fior di latte, and olives sun-dried to mellow their briny flavour. 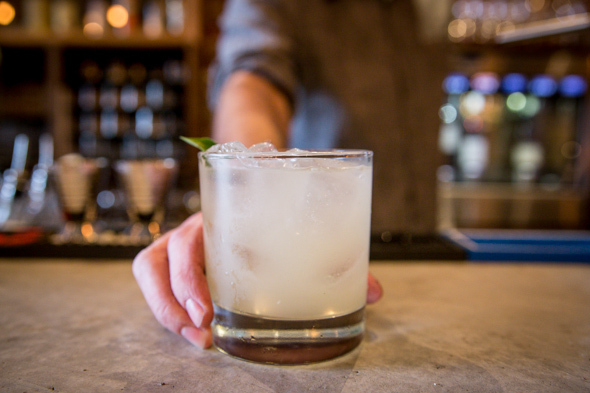 From the bar, try cocktails like the Run, Tommy, Run ($14), a blend of Tromba Tequila, agave, lime, basil and chilis. 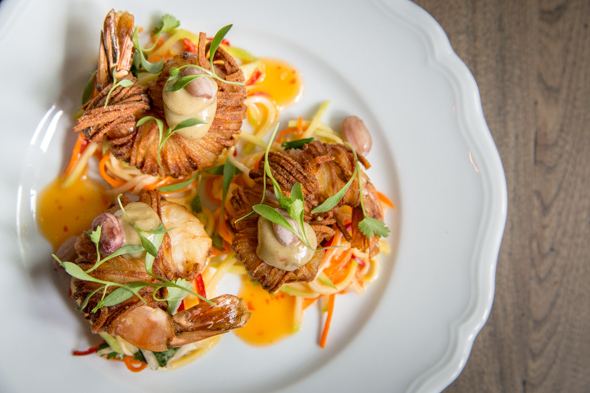 The Good Son is open Wednesday to Friday for dinner from 5pm, while lunch will be offered on weekends from 11:30am. To compliment the restaurant, a New Orleans speakeasy-style cocktail lounge named Wayward is slated to open on the floors above.